Apple gadget lovers out there, I just discovered weekend deals that are sure to make your Christmas shopping much easier! Apple reseller Beyond the Box at Rockwell is holding weekend promos which, according to their staff began on October 13 and ends on January 13, 2013. This special promo happens only during weekends. If you visit their Rockwell outlet between 12mn to 6am during weekends, you can avail of their special offers which they announce weekly on their facebook page. For example, on the weekend of October 20, they offered Buy1 Take 1 offers on Musubo and SGP cases for iPhone 4S and Juicy earphones. They also took 50% off the prices of HEX straps and Simplism Starter Packs for iPhone4, iPod Touch, Classic, Nano and Shuffle. Other deals were also offered over the weekend. They have new weekend deals every weekend. Just check out their facebook and twitter page at the end of every week for their newest offers. Citibank Credit Card holders can also enjoy 0% Paylite of up to 24 months on their MacBook Pro and MacBook Air purchases at Beyond the Box. This offer is also available for iPad and iPod Touch purchases. Beyond the Box offers 12 months installment for these products for other credit card holders. 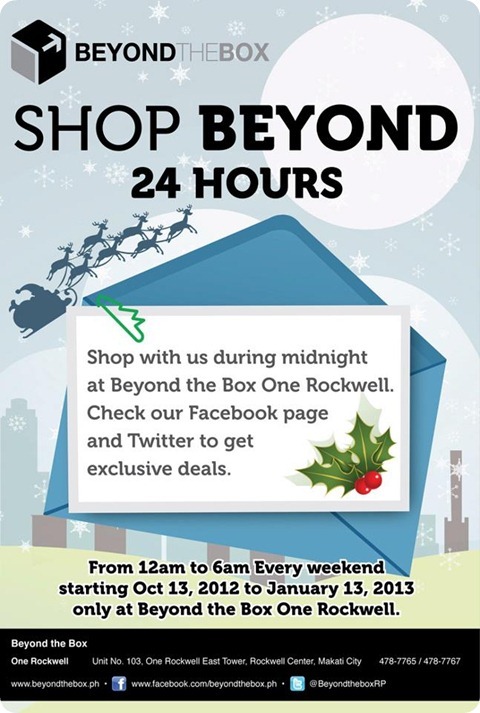 Beyond the Box also came out with gift cards, a perfect gift for your loved ones this Christmas. Give them the gift of choice by giving them gift cards which they can use on their purchase from a large array of Apple products and accessories.